a love story with our most precious loved one. That’s why I am so passionate about what I do. I absolutely love to work with couples at all stages and of all ages tell the story of their love through photography. I firmly believe that we all have that passion for each other inside of us. Capturing that special connection between people and creating beautiful art that will be a testament to that love for generations to come is why I adore what I do. Living my best life. 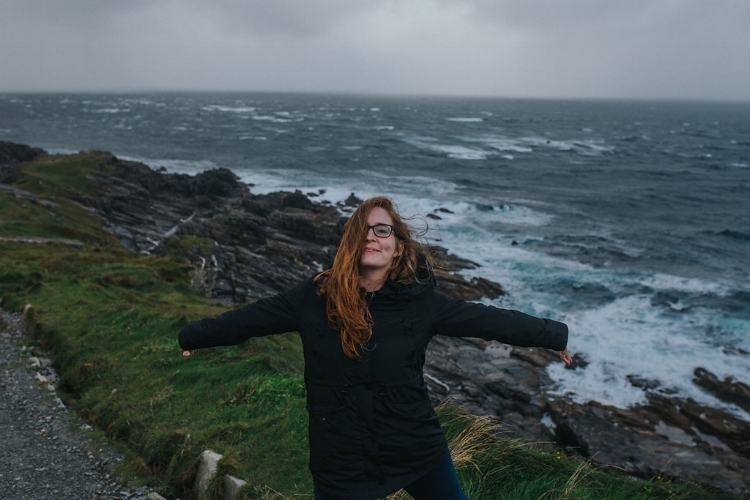 By far I am at my happiest when I'm exploring Ireland's epic coastline with the wind in my hair. I’ve been featured in some amazing places that you can check out right hereee. I'm all about mushy and romantic moments, but I'm also completely weird and nerdy. I have been obsessed with Harry Potter since elementary school and have a HP tattoo. If you stumble upon my error page, you'll get a better sense of the weirdness ;). I have a Bachelors degree in Criminology. Which actually does kind of fit for what I do. I'll explain one day when we meet! I'm a fry connoisseur. One day I hope I'll open a fry truck. The only drink you should have with brownies is orange juice. I feel passionately about that. I met my husband in middle school, but we didn't start dating until college. Now we have two daughters and a cat (named Lady Catelyn Stark of Winterfell... or Cat for short). I feel most at home in Northern Ireland. One day I'll live there. There are a few things that inspire what I do. I find that what I do gives me hope for the world. Seeing the light behind lovers' eyes as they gaze at each other never ceases to humble me and fill me up with so much belief that the world will be okay. I can't explain it, but there is a gratefulness and humility that comes from telling these intimate stories. My other two big inspirations are music and nature. Both of them allow me to feel most like myself and most at peace. Music gives me literal visions of light and movement. It validates my innermost self and gives voice to parts of me that usually feel unknown. There is something magical in the breeze. I have never felt more alive than standing atop the Irish mountains, watching the waves crash. There is something deeply spiritual and connective about nature, it feels like being aligned with the whole universe.